Neymar is pleased Brazil will not have to go up against Lionel Messi when they take on Argentina in Saudi Arabia on Tuesday. Messi was not included in Lionel Scaloni's squad for the second successive set of internationals as speculation over his Argentina future in the wake of a disappointing World Cup campaign rumbles on. 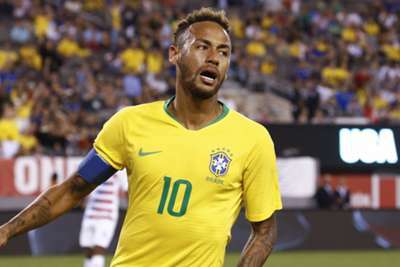 Neymar acknowledged the absence of his former Barcelona team-mate is a blow for the spectators watching the game, but he feels it gives Brazil a greater chance of overcoming their rivals. However, the Paris Saint-Germain star was keen to emphasise that Argentina still possess great quality, singling out Paulo Dybala as an example of the talent in their ranks. "For those who love football, having Messi out of a game like this is bad. But for us it's good," Neymar told a pre-match news conference. "We never underestimate Argentina's quality, the players they have in their squad. "It's a very difficult game. We will have to do our job and it's always good to play them. There are no favourites." After operating from the left wing for much of his career, Neymar has on occasion been used in the number 10 position by Thomas Tuchel at PSG this season. The 26-year-old, who assisted Gabriel Jesus and Alex Sandro in Friday's 2-0 win over Saudi Arabia, enjoys the playmaking aspect of the role and is open to any demands placed upon him. "I think, depending on the match, it might be necessary to change the position a little, but that's the decision of the coach, not me," said Neymar. "In Paris, I've been playing centrally and here, Tite gives me more freedom, not only to stay in the centre but also up front. "Over the years a player will look for their best position … it is part of football, but I think I still have a lot to give. "The more you play, the more experience you have and will know the time to decide a match or go forward. I know how to do this on the pitch and I know my role. "I am an attacker on my team, a playmaker. Not just me, but also [Philippe] Coutinho, [Roberto] Firmino, Lucas [Moura], [Gabriel] Jesus – we are there to create chances, to set up our team-mates. "I'm happy, I do not run away from any responsibility on the pitch. I look to dribble, create opportunities."